The Vienna Residence Orchestra, a chamber orchestra with a long tradition, was established in order to present the Viennese classics in full. 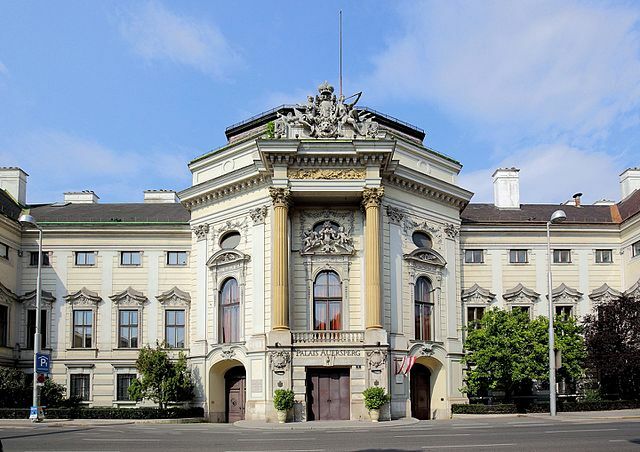 The numerous ranges of events in recent decades were presented in Viennas most beautiful palace. The orchestra plays pieces from Mozart to Johann Strauss with between 10 and 40 musicians. In 1991 the orchestra was the official Austrian representative at Mozarts anniversary celebrations and played numerous concerts at the Wiener Klangbogen festival. Formal evening dress is not really necessary. The Palais Auersperg, earlier called Palais Rosenkavalier, is a baroque palace in the Auerspergstraße 1 in Vienna's Josefstadt district. The Palais Auersperg was built in the years between 1706 and 1710 on the plot of the former Rottenhof with the plans of the two well-known architects Johann Bernhard Fischer von Erlach and Johann Lucas von Hildebrandt for Hieronymus Capece de Rofrano, to whom the former name "Rosenkavalier" refers. The middle part of the Palais was altered between 1720 and 1723 by Johann Christian Neupauer. From 1759 Joseph Friedrich von Sachsen-Hildburghausen rented the Palais and hired Christoph Willibald Gluck as head conductor of the concerts held there. In 1749 Prinz von Hildburghausen started to use the Palais as his winter residence. Prinz von Hildburghausen hired Giuseppe Bonno as musical conductor of the palais. Between 1754 and 1761 weekly music courses were held during the winter months. In 1777 Johann Adam Fürst Auersperg, friend and confidant of Kaiser Franz-Stephan and Maria Theresia, bought the Palais, at that time still called Palais Rofrano. From 1786 the Palais was renamed Palais Auersperg and was the setting for a series of important and well-known musical events, notably Idomeneo by Wolfgang Amadeus Mozart and Sieben Worte des Erlösers am Kreuze by Joseph Haydn were performed there. As Johann Adam Fürst Auersperg`s second marriage stayed childless and the children of his first marriage had already died, he adopted his nephew Carl Auersperg (1750–1822). Carl Auersperg accepted his inheritance in 1795. Unhappily the marriage of Carl and his wife Josepha also stayed childless so in 1812 they adopted Prince Vinzens Auersperg, who accepted his inheritance in 1817. In the time between 1827 and 1837 Prince Wasa stayed at the Palais Auersperg with the Swedish Royal Family because his inheritance had been contested in Sweden. In 1864, on the orders of Vinzens Auersperg, a ballroom building was built along the Lerchenfelderstrasse. After his death in 1872 his widow Wilhelmine commissioned further alterations to the ballroom building in order to rent the facilities to the Geometric Institute. In 1878 Franz Joseph Emanuel (1856–1938), son of Wilhelmine Auersperg, and his wife Wilhelmine Kinsky took possession of the Palais Auersperg. Wilhelmine Kinsky organized many charity events for the benefit of the organization called Vereinigung zur Errettung verwahrloster Kinder. Pieces of theatre and music were performed in the Rosenkavaliersaal, partially with the participation of members of the aristocracy. In 1901 Franz Joseph Auersperg returned the ballroom building to its initial use. Unfortunately, in the course of the Second World War the ballroom building was completely destroyed and the remains were therefore removed. Between 1923 and 1935 the Palais Auersperg was temporarily rented to the Bundesdenkmalamt and a film company. In 1940 Ferdinand Auersperg (1887–1942) inherited the Palais and in 1942 his sister Christiane Croy accepted her inheritance. She lived with her family in the upper rooms of the Palais during the Second World War. They also hid members of the resistance there during the Second World War and there is a sign near the entrance of the Palais which commemorates this. In 1944 the organization „Provisorische österreichische Nationalkomitee“, better known as O5, was established in the Palais. In 1945 the Palais was seized by the Alliierte Kommandantur, the police force of the Allied Control Council, and was subsequently used as their headquarters. Konsul Alfred Weiss, founder of Arabia Kaffee, bought the Palais in 1953. In 1953 and 1954 it was extended by the architect Oswald Haerdtl who added the orangery, the winter garden and more functional rooms. Alfred Weiss opened a large café for 600 guests in the Palais, with a terrace next to it. After his death, his descendants sold the Palais to a company called General Partners A.G.. In the beginning of 2006 the Palais was sold again to an old European family. The State Apartments remained the same and are still used for musical purposes. In the upper floor most areas have been changed into office rooms. In the next few years the Palais will be restored and a small museum is planned. Currently the Palais is used for balls and musical events of various kinds; it has eleven rooms and can accommodate up to 1000 guests. It is how can you expect it differently , in Vienna, and bears - just since 8 October 1777 - Palais Auersperg. On that memorable day acquired by Prince Johann Adam Auersperg , which was about 50 years ago built by the architect Giovanni Christiano Neupauer according to the plans of the famous Johann Bernhard Fischer von Erlach. The builder was a certain Hieronymus Capece de Rofrano and thus we are in Johann Strauss 's opera " Der Rosenkavalier " . Octavian de Rofrano , the gentleman at the court of the great Empress Maria Theresa, the gallant lover with the silver rose. Because Hugo von Hofmannsthal did indeed a Rofrano strives for his libretto as a model for Octavian , only was this Peter and was the son of that Jerome, who for the property - a old brickworks on non- less than 28,000 florins on the table of the House let it ring . He could afford it , because he held the office of Postmaster-General of the Habsburg territories in Italy.